Children sometimes need some help developing all five of their senses. Children learn in a multitude of ways. For some, they need to see something visually in order to grasp the concept. On the other hand, many children learn best by listening, and that is why they excel in a classroom/lecture-type setting. Regardless of which kind of learner they are, children sometimes need some help developing all five of their senses (sight, smell, hearing, touch, and taste). For this reason, sensory play has been shown to be a useful measure for child development. Here is a brief overview of sensory play and why it is beneficial for children. Sensory play can be defined as any activities that require children to use any of their five senses. It is important for children to be explorative at a young age. Whether the children realize it or not they will be using scientific processes as they take part in sensory play. As they grow older, It will help them in many different aspects of their lives. 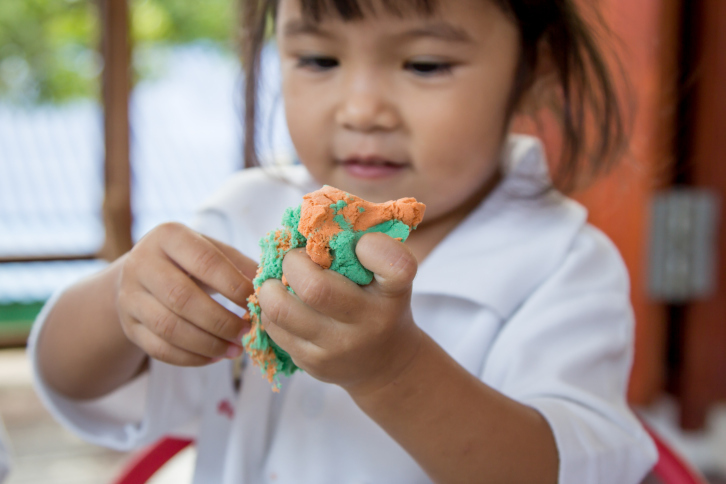 A common misconception is that sensory play is all about touch; however, this is not the case. It is more than providing a child with playdough or a water table. Sensory play will encourage a child to use all senses. For example, a child will learn different scents from cooking and baking. It is about getting the child to develop all five of their senses through various means. There are two types of motor skills: fine motor and gross motor skills. From a young age, children need to start developing both types of motor skills. Gross motor skills refer to the coordination of large muscle groups and are responsible for activities like walking and running. Fine motor skills refers to activities that only require small muscle groups and these are the kinds of activities that sensory play helps develop. Examples of such include tying shoes, writing, holding small items, and buttoning clothing. This entry was posted on Friday, October 27th, 2017	at 2:54 pm	. You can follow any responses to this entry through the RSS 2.0 feed. Both comments and pings are currently closed.